The author uses a variety of methods to paint "word pictures" of the Greek New Testament and make these pictures of the past alive again today. By A.T. Robertson. The Word Pictures in the New Testament by A.T. Robertson (1863-1934), Professor of New Testament Interpretation at the Southern Baptist Theological Seminary in Louisville, Kentucky, was originally published in six volumes (over 2,700 pages) between 1930 and 1933. Written 43 years after Vincent's Word Studies in the New Testament , Robertson's work incorporates additional insights gained from more recent methods of comparative grammar which shed a flood of new light on the correct meaning of New Testament forms and idioms. 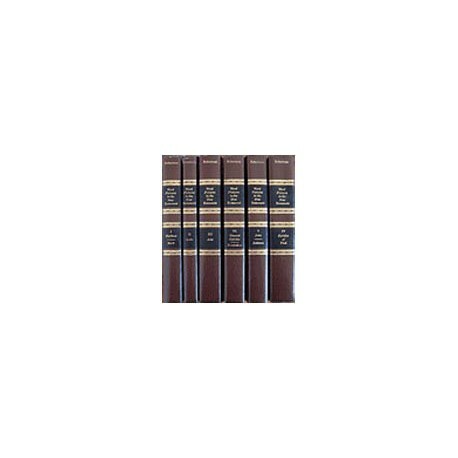 Robertson's Word Pictures is not a formal commentary, but rather a discussion of Bible words selected for their richness and usefulness to the average student of God's Word. In such discussions, he uses a number of methods. At times he investigates the lexical or grammatical meaning of a word, and at other times he brings insight gained from archaeological discoveries. He then may examine a word's contextual meaning, picking apart every nuance surrounding a word or group of words, even analyzing what the mood of the passage might suggest, all to better understand the word's meaning in the original Greek. Robertson's ultimate desire is to take the "word pictures" of New Testament Greek and make these pictures of the past alive again today, thus leading the modern reader closer to an understanding of the Living Word of God.